Ben Stiller gets his sweater on in Greenberg. Something dawned on me as I watched the opening credits to Noah Baumbach’s Greenberg. It’s been a long time since I’ve watched a film about normal human beings. The credits, which run over “Jet Airliner” by the Steve Miller Band, seem to be deliberately evocative of a movie from the 1970s, when story and plot mattered less than it does now and when movies were unafraid to take their time, even meander. We’re literally witness one of the lead characters in the film, Florence (played with great vulnerability and unintentional sexuality by Greta Gerwig) run errands. It couldn’t have been a more pedestrian start to a film. That’s what Baumbach (director of the searing The Squid and the Whale (2005)—which haunted me for days) accomplishes so winningly in Greenberg. 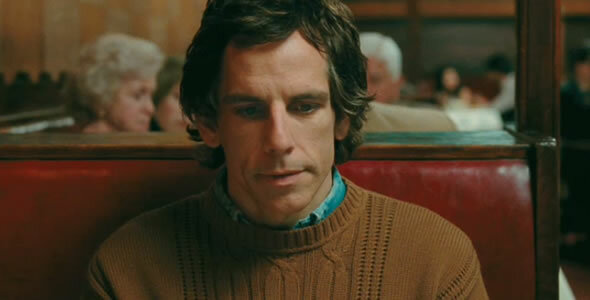 Florence and the film’s eponymous protagonist, Roger Greenberg (Ben Stiller) have the feel of reality, which is to say they reek of disappointment. I didn’t love Greenberg and while I was happy to spend time with Roger and Florence and their “dog with AIDS” I was just as happy to have that time come to end, with that same sigh of relief you have when the last party guest has departed. They are frustrating, borderline unlikeable people. And the mechanics of the thin plot creaked and groaned a bit in trying to keep these two misfits together. But more to the point, Greenberg is the first independent, or quasi-independent film, I’ve seen in awhile. I spent the entire summer, and indeed much longer than that, watching a lot of classic Hollywood, with some notable exceptions such as La Strada—and even that trafficked in a highly stylized, archetypal reality. The first movie I recall watching while being aware of a director’s flourish, oddly enough, was The Color of Money in 1986 and that was only because of Scorsese’s pyrotechnics. I had seen films such as 2001 but that didn’t mean I understood them, or that experimental films like those were attempting to rewrite the language of cinema. Movies were entertainments. Nothing less. Nothing more. And I still have a weakness for well-crafted, mindless, action film such as Raiders of the Lost Ark (re-watched yet again this summer). The bulk of the films I watched this summer were in that vein. There’s very little difference, really, between China Seas (1935) and The Hunt for Red October (1990). I suppose that makes me lowbrow. There’s nothing I can do about that. Especially at this late age. In the 1990s, inspired, like so many people in their twenties, by Tarantino, I subscribed to screenwriting magazines and worked on a couple of (very bad) screenplays. And like many, I rediscovered the great films of the 1970s. I began to be able to differentiate good works from bad, or even harder, great works from good ones. I thrilled to same crop of new talents as my fellow enthusiasts: Wes and Paul Thomas Anderson, Charlie Kaufman, Payne, Fincher, the Coens, Soderbergh, and discovered Altman, Mann, and others. But I have never demanded reality from movies in the way, perhaps, I did from literature. Films were, and are, escapes. So when I’ve sat down with Greenberg or a Laurel Canyon (2002) or a You Can Count on Me (2000), it’s felt more dutiful than exuberant, even though I knew it was good for me. Like fiber. Even the foreign directors I admire, such as Antonioni , Kurosawa or Wong Kar-Wai, operate in a realm apart from the normal. Don and Sally share a quiet moment in the Draper kitchen. There are, of course, collisions of art and story—which can result in transcendent experiences. I’m not a complete pagan. Those, more often than not these days, occur on television. Which brings me to Mad Men. I’ve just started Season Four—having watching the first episode of Season One a matter of a month or two ago, so it’s safe to say I was hooked, and hooked bad. But it’s a bittersweet attraction. Mad Men, for my meager money, is about the closest thing a serialized television show has come to the work of writers such as Fitzgerald, Cheever, Updike and Ford. Its power lies in its willingness to be slow, quiet, and ordinary. The genius of the show is that Don Draper is a cipher in both his world and our own. By that light, he becomes all of us, everyone who feels they show a different face outward than inward. The show captures the tension between ideals, between expectations, and the sometimes harsh punishments everyday existence metes. Draper embodies the American pressure to deliver and he transmits that urgency to us. It also hits close to home. The slow disintegration of the Draper marriage and the effect on the children is brutal—and the parallels between my parents lives, my own life and the show sometimes are too much to bear, such as scenes in the fourth season of the Draper children visiting Don’s dreary Manhattan apartment, or the continuing anguish and confusion on the face of Don’s daughter, Sally. The show is a testament to the transportive effect of great literature, where the point of view of the characters becomes your own. But Mad Men, like The Squid and the Whale, is also a reminder, at least to me, of the path in cinema I’ve avoided in the same way I often avoid mirrors, or photographs. There can be such a thing as too much reality. This entry was posted in From the Queue, Television by James Oliphant. Bookmark the permalink.